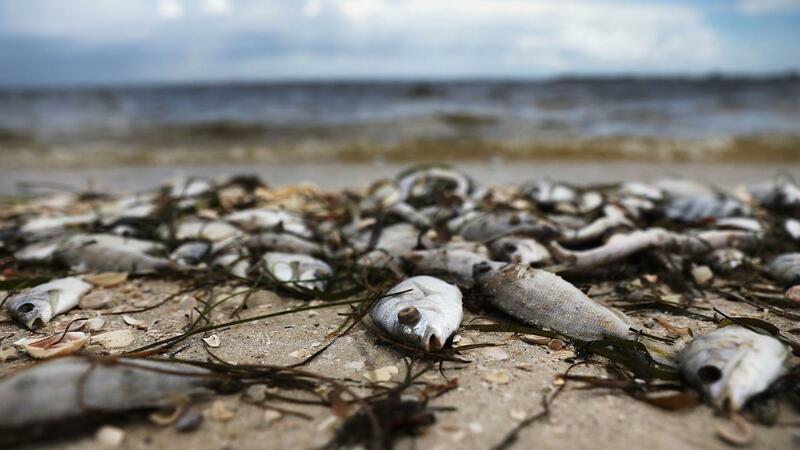 Red tide has hit the east coast and Palm Beach County. The stench of rotting fish and the sensation of burning in the lungs and eyes are not what one typically associates with Florida’s picturesque beaches; however, these issues are what has caused the beaches on Florida’s Eastern coast to be closed for nearly a week, with red tide being the primary cause. Red tide is an algae bloom that is caused by Karenia brevis, and according to the Florida Fish and Wildlife Conservation Commission, blooms typically occur yearly along the West Coast, and less commonly along the East Coast. These blooms can also last months, and they are capable of killing fish, birds and other marine animals. Manatees, turtles, dolphins and even sharks have been found dead, as they feed on animals that are affected by the algae. This is especially harmful for endangered animals, such as the loggerhead sea turtle. Red tide also causes economic issues. Florida Governor Rick Scott announced in late August that the government would be providing $3 million to help counties affected by red tide. The money will go towards clean up efforts, monitoring red tide and helping with further research for red tide. “All the lifeguards were wearing surgical masks and there was a couple guys [on the beach] with hazmat suits taking samples,” Barry Friedman, owner of Lake Worth Tee Shirt Company along Lake Worth Beach, recalled. His store was also affected by the red tide. “It hurt the store. We were pretty dead for about two weeks, and then when the news came on and they were touting that red tide was over and that the stores were open, the people came back,” Friedman stated. The effect that red tide has had on local businesses is palpable, as the beach was closed for a few days, but red tide was present for several weeks. Friedman has been running his store for almost 35 years, and he mentioned that the red tide from this year seemed worse than the last time he had witnessed it. The east coast has not been affected by red tide since the mid 1990s, according to ABC News, but there is no effective way to stop the issue. Red tide is naturally occurring, and the algae thrives in salty warm water. This means that around storm season in Florida, the algae flourishes. Additionally, according to National Geographic, an increase in fertilizers and other nutrients released by humans could very well have served to amplify the red tide. Another factor that may be strengthening red tide is climate change, as warmer waters can better help harbor the algae. “Climate change has likely affected red tide in two ways. First, increases in surface water temperatures have allowed for increased rates of algae growth and the range of where red tide is found. Secondly, changes in precipitation levels in different areas could perhaps affected irrigation and runoff amounts,” Stubbs added. Although red tide cannot be stopped, its effects can be mitigated. By reducing factors such as fertilizer and carbon footprints, red tide can be much less deadly and effective as it is now. As of Nov. 1, the red tide bacteria has not been present in Palm Beach County, as according to the Florida Fish and Wildlife Conservation Commission.